Most people are aware of how debt problems occur, or at least they think they are. It seems so obvious doesn't it? If you want to stay in the black then you just make sure you pay your bills and don't overspend. Most people think getting into serious debt is only something that happens to careless people, people who spend far more than they should and ignore their bills - even the final reminders. But, sadly, that's not the case. Who Can get into Debt? Despite what people may think, anyone can get into debt. All it takes is one or two wrong turns and things can spiral out of control. Anything from missing a few credit card payments to forgetting to pay your gas bill can start the downward spiral into debt. But the biggest culprit when it comes to how people get into debt is the current culture in the UK. How often do you turn on the TV and see advertisements for holidays? Computers? Widescreen televisions? Or furniture? Quite a lot right? Well how often do you see such adverts which also advertise the opportunity to 'buy now, pay later'? Even more so? The culture in the UK today is very much so "I want it now". Working hard and saving to buy something special just isn't good enough these days. Few people want to wait two years to take a dream holiday. Even fewer think putting a little each month from their wages away in order to treat themselves to a widescreen TV at Christmas. The fact is, nowadays, when people want something they don't want to wait. The 'buy now pay later' option allows people to purchase whatever it is they want and pay it back in instalments. Seems ideal doesn't it? You can take home that fabulous PC today and you don't have to hand over a penny. What could be simpler? But what most people don't consider is the interest they will end up paying. Some companies charge extortionate rates of interest on their products in 'buy now pay later' deals. Often a person can end up paying over double the price of the product. These interest rates are mentioned at the point of sale but not always overtly enough. Remember, the salesman wants a sale. He will tell you about the interest but he is unlikely to emphasise just how much that interest will mean you have to repay as he does not want to dissuade you. Make sure you always read the small print and work out exactly how much you will end up repaying. Of course it's not just the 'buy not pay later' method that causes people to get into debt. 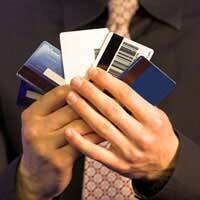 Even savvy buyers who are aware of the interest these transactions incur can find themselves sin debt when they choose another method of satisfying their "I want it now" attitude - credit cards. Credit cards can come in handy. If you need to make a large purchase and don't get paid for another three weeks you can put it on your credit card and repay the debt in full when you get paid or pay back both the interest AND a part of the debt each month. However too many people see credit cards as an easy way of paying for things and spend too much and repay too little. Remember, the interest on credit card can really add up when it comes to how much you owe. Even a few careless purchase can leave you at risk of getting in debt. Always be aware of your finances and how much you are spending.